Family movie night again. 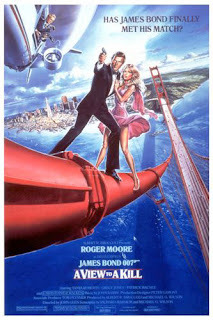 This time we find the Bond movie, A View to a Kill, with a blimp (a Skyship) in a starring role. The web gives us lots of trivia about this movie, including the fact that the Skyship had been in LA for the Olympics and that enabled the movie makers to bring it to the San Francisco Bay Area for the long shots they needed for the film. I was amused to note that the fictional Zorin Industries branding was made green, red and white so that it would fit with the Fuji branding on the airship in the long shots! But for us the captivating moments were the views of San Francisco* and the Bay taken from the airship on a beautiful sunny day. If only we could use those scenes in our presentations...! * this is a link to the San Francisco Chronicle aerials page, many taken from blimps. It gives you the idea.